Grassroot level research is rare. Dr Cynthia Groff lived for months with girls in a hostel in the Kumaun area of Uttarakhand (North India) and researched how the local language is used in different settings. 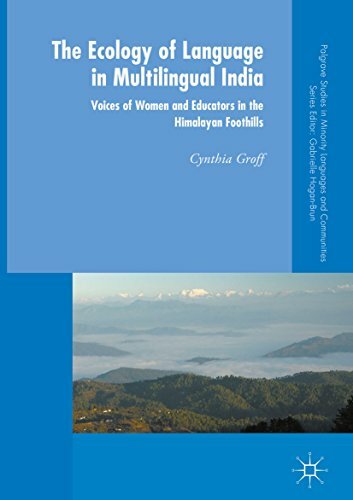 Her PhD research has now resulted in a book: The Ecology of Language in Multilingual India: Voices of Women and Educators in the Himalayan Foothills. Last month Pratham Books, a UNICEF founded NGO, released more than 800 books in 27 languages on the StoryWeaver India website. Anyone can add, translate or read books there. The Indian Express reports in the article A book in every hand: Pratham Books wants to make reading fun and accessible for children that a week after releasing the website https://storyweaver.org.in/ there were 800+ books and 20,000 reads. Currently the teller is on nearly 35000 reads and the site has over 900 stories in 27 languages. Till now the languages listed are mainly state or foreign languages, but it is likely possible to translate to or write in any langauge. Worth trying! There are some differences and similarities with the software BLOOM that recently won the Enabling Writers competition (see Blog Post from last June). Bloom can be used off line and is focussed on creating books for paper publishing while Story Weaver is particularly good at web publication. They both work well together, see e.g. the book "Listen to my body". Just making a reading method for children in minortity language communities is not enough. They need books to read, many books! BLOOM software was recently selected as one of the three finalists in an "All Children Reading" software contest. "Bloom dramatically lowers the bar, so that many more people can get involved in building a large collection of local language books. Bloom was designed with new computer users in mind, and it has special features to guide them in simple book making, so people need far less training than alternatives such as Word, Publisher, or In Design." I have heard from several people that BLOOM can handle non-Roman Scripts, but more than that, I learned that their helpdesk is very responsive when you happen to encounter a problem. Bloom has started a Bloom library in which you can share your books so that others can benefit from them. You as user can also benefit from the more than 150 books already in the library and can adjust them to the local situation. Bloom links to the The Art of Reading which gives you access to over 10,000 black & white illustrations from around the world.